Two years ago, I got to see and interview The Strypes for the first time at The Great Escape. 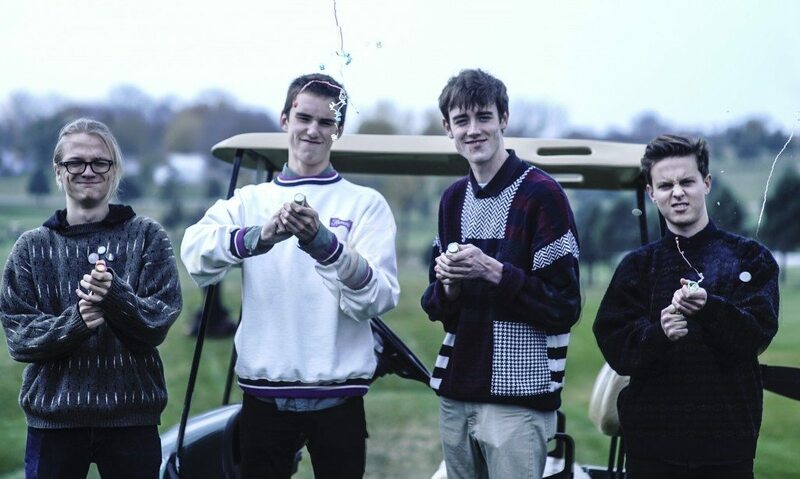 In their mid-teens at the time, they were conquering the UK in 2013 and then made great strides in the US last year with their fast-paced garage and r&b flavored indie. Many of their best songs were covers and thus begat the question: Great band, amazing live, but how would they evolve? Here’s our first hint an an answer: “Scumbag City” slows down the pace a bit, adds some intriguing layers, and shows lead singer Ross in finer form than ever on this well-written tune. If they keep this up, they will be just fine and have a serious shot at a long-term career. Their UK album drops late July. As of this writing, there is no specific release date scheduled for the US but we know that will come. 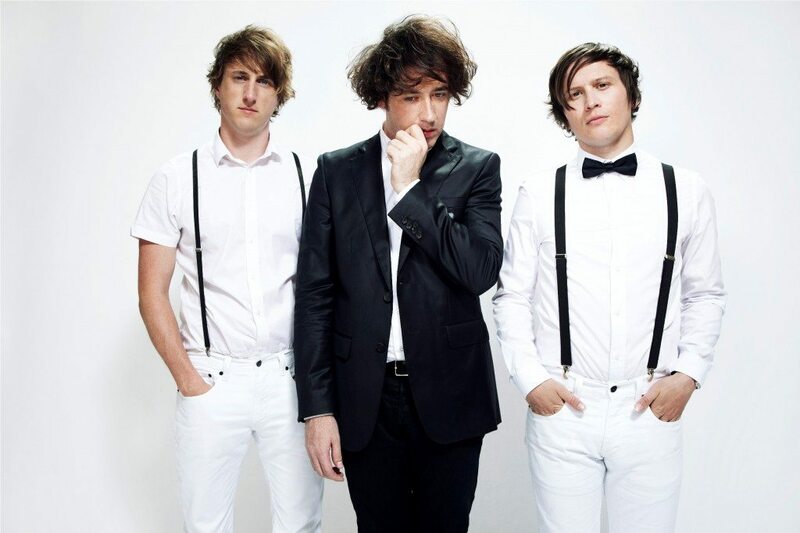 Check out our chat from TGE 2013 right here. Reviewed by Bruce Rave. 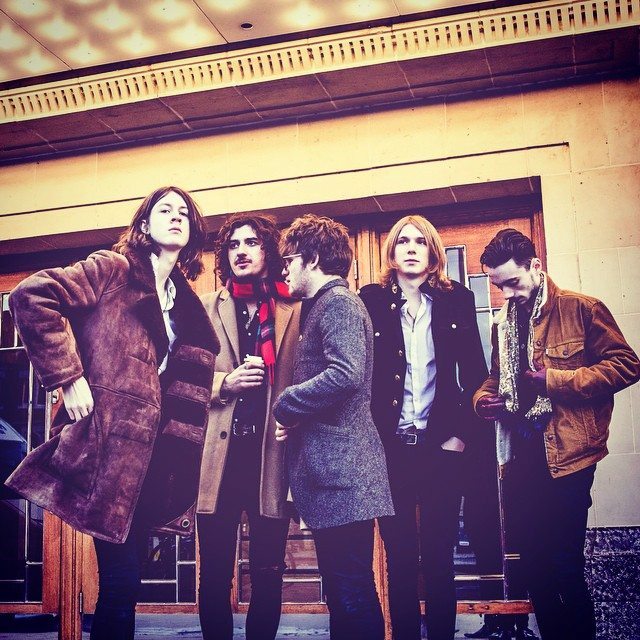 Blossoms were highly recommended to Bruce Rave by leading BBC tastemaker Steve Lamacq. After seeing the band at SXSW and knowing they’d be at The Great Escape this year, Bruce targeted them as a rising band to hang with. Here we discuss their musical and live approaches, their Stockport roots (close to Manchester), the mistaken efforts of British media to pigeonhole them into a given category, and more. 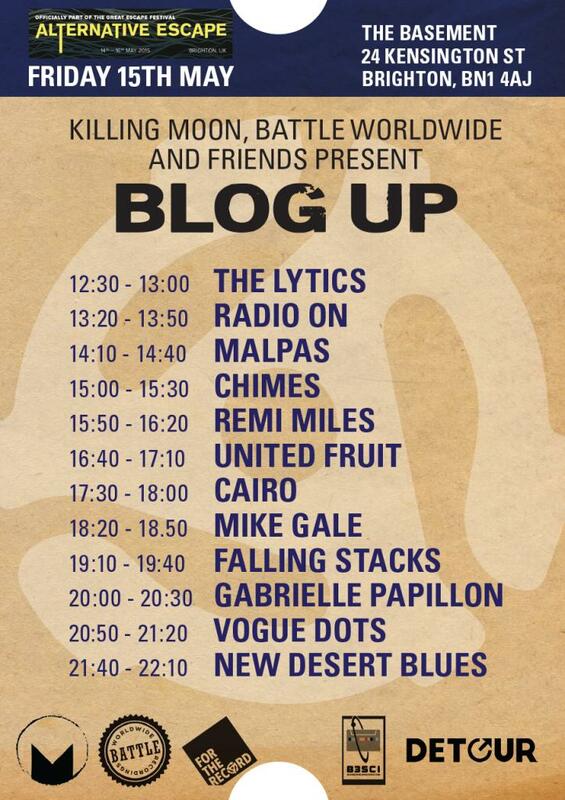 B3 is very pleased to announce that we’ve teamed with Killing Moon, Battle Worldwide and Detour to present BLOG UP at The Great Escape in Brighton. The Friday May 15th show at The Basement on Kensington Street will feature performances from favorites Remi Miles, New Desert Blues, Cairo and many more. There will be priority entrance and booze for accredited bloggers/music website people too. To RSVP, hit the email HERE. See you freaks in Brighton. 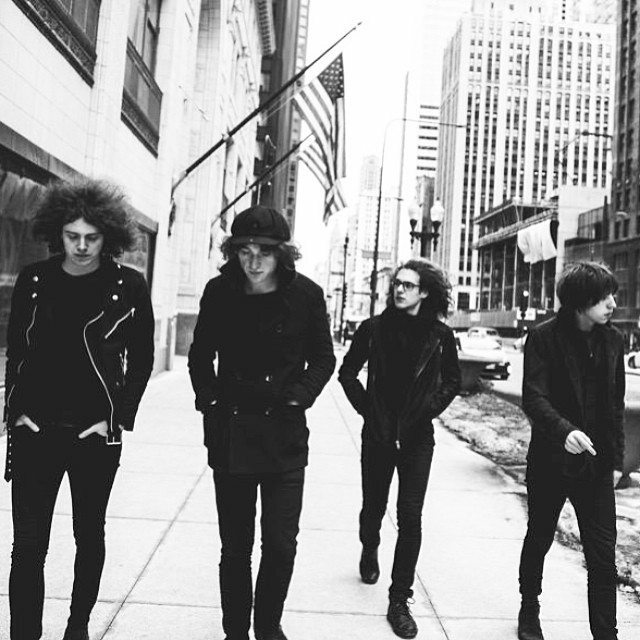 Bruce Rave chilled with Catfish and the Bottlemen’s Van McCann for a second time during South By Southwest this year. 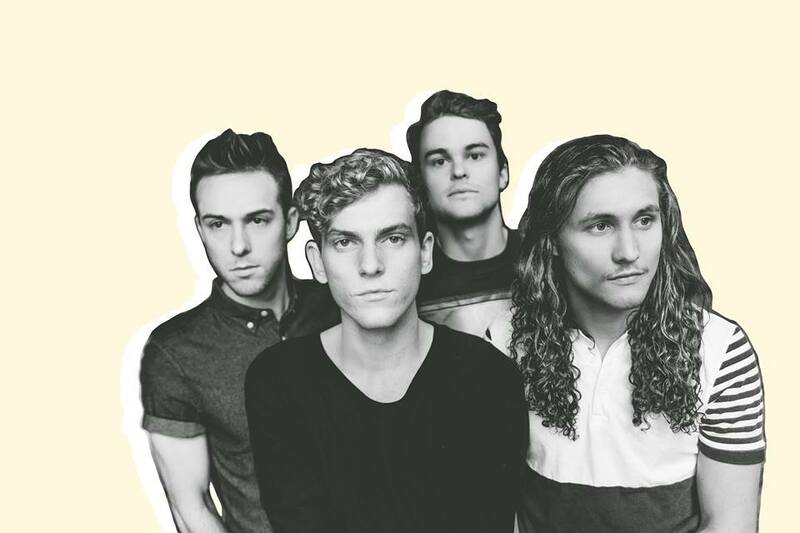 Lots had happened since their initial chat back in November before the band’s LA debut. 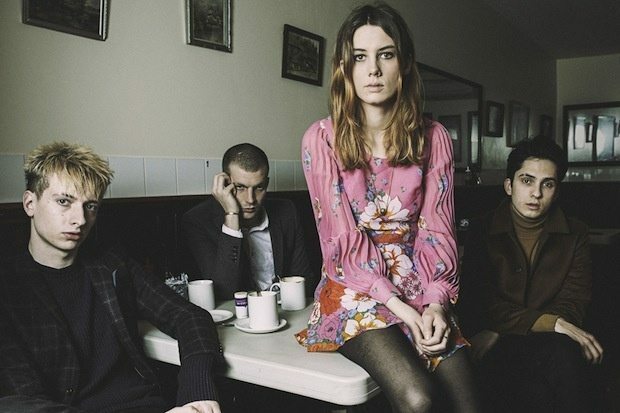 Catfish just drew 10,000 in London, and their “Kathleen” notched a top 15 peak on the US alternative charts. They talk about all this, converting the originally negative UK press, how life has changed with the success and constant touring, new music about to be recorded, how he handles death of loved ones, and much more. What do you get when you mix Franz Ferdinand with Sparks (FFS)? You get something that makes a whole lot of sense. Franz leader Alex Kapranos has called Sparks “a huge influence” and what you get in this collaboration is a real party. “Piss Off” sounds mostly like Sparks back in the 70’s when they were recording songs like “Angst In Your Pants”. It’s got those choppy vocals and tempos along with the familiar Sparks harmonies. 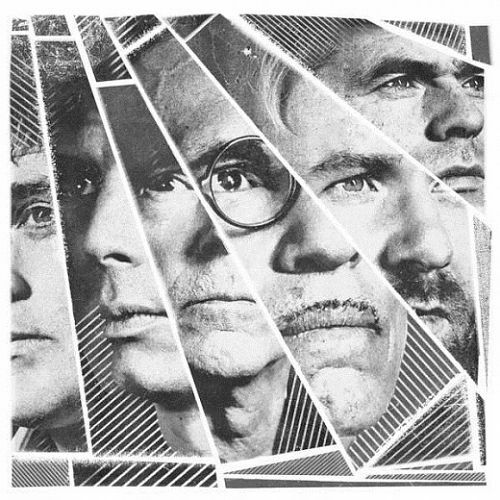 It’s a win-win that brings an overall energy infusion to Franz Ferdinand and brings Sparks back to the forefront. Look for the “FFS” album to drop in early June. Reviewed by Bruce Rave. B3SCI was the vehicle that introduced me to these talented dudes. Lead singer Jake (“The Turntan”) wrote to me in January through the blog and he mentioned he liked some my “Rave’s Fave” posts. 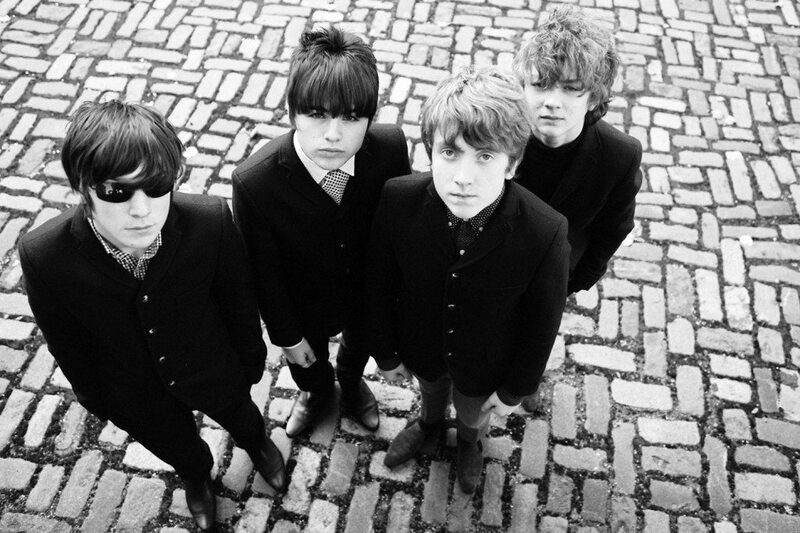 He attached their track “Little Grace”. All too often, these sincere notes are accompanied by music that isn’t quite my glass of scotch. I immediately liked what I heard and got in touch with Jake as well as band management. 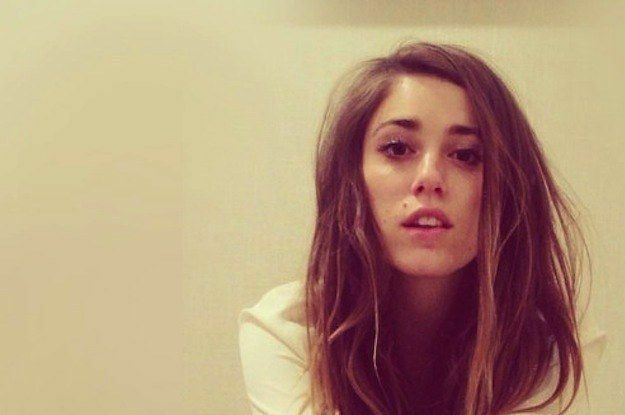 The rest of their “Bashful Creatures” EP lives up to the promise of that first track. 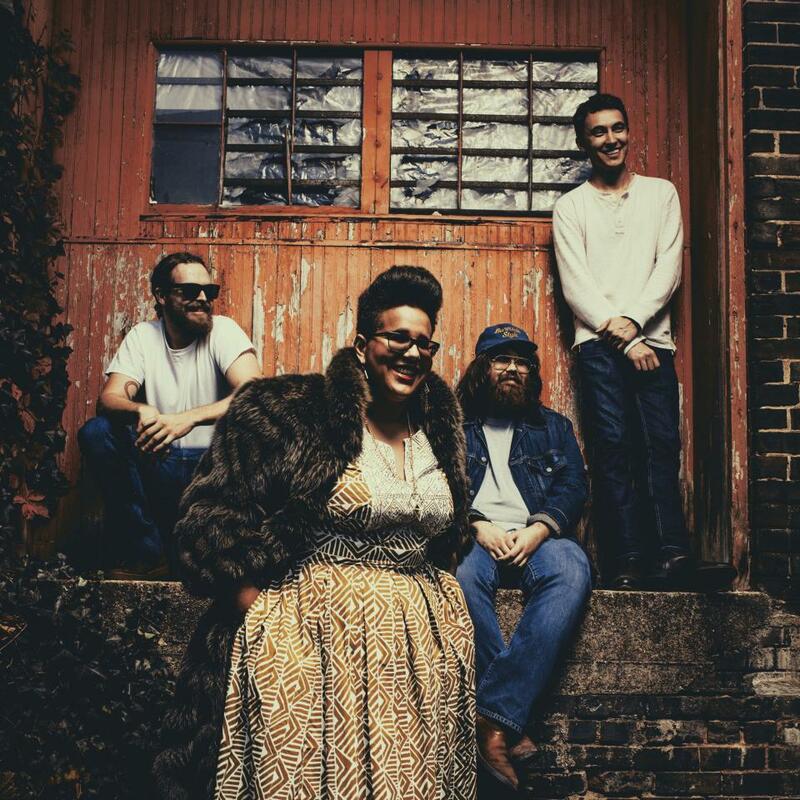 Meanwhile, buzz was developing thanks for local radio support for the band in Minneapolis-St.Paul and an NME nod in England as one of the bands to watch in 2015. Reaction at SXSW was really strong and the band had one of the best weeks a new act could hoped for. They’re awesome live as you can see from their Conan appearance the week after SXSW. This chat took place just as that amazing week in Austin was getting under way for the guys. Great name for a band, right? Three of the four Gateway Drugs peeps include Gabe, Noa, and Liv, the two sons and a daughter of bassist Prescott Niles of The Knack. Yes, this family grew up in the aura of that unforgettable “My Sharona” octave bassline. That was the #1 song of 1979 so how could it not be an influence, right? Their sense of melody is definitely present, but this band rocks hard, heavy, and raw. “Fridays” has a driving, hooky garage feel to it that will stick to you throughout, starting with the intro. Check out their Magick Spells album, which will show you the depth this band possesses. They are currently on tour with Swervedriver and will be at SXSW next week. Their Roxy show last week was a major success here in West Hollywood; the sound mix wasn’t favorable to their vocals but what came through was that these guys seriously know how to play and that they’re at the gateway to bigger things. Reviewed by Bruce Rave. SXSW 2015: B3SCI x ALL THINGS GO x HYPE MACHINE in Austin, TX. 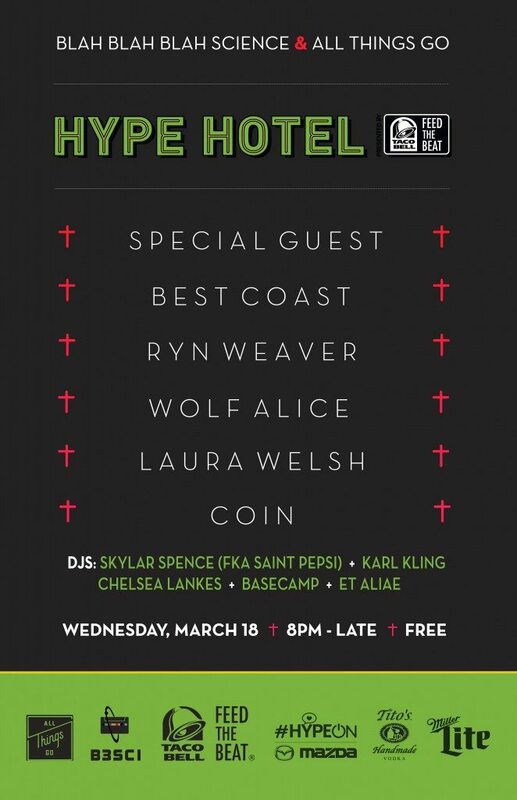 B3SCI is very pleased to be partnering with our blogger communards All Things Go and the venerable Hype Machine for a show at this year’s Hype Hotel at SXSW presented by Feed the Beat. Featuring favorites Best Coast, Ryn Weaver, Wolf Alice, Laura Welsh, and COIN and DJ sets from Karl Kling, Skylar Spence (fka Saint Pepsi), BASECAMP, Chelsea Lankes and Et Aliae. The show kicks off at 8 PM at 1100 E. 5th St in East Austin. RSVP HERE. Be square of be there. 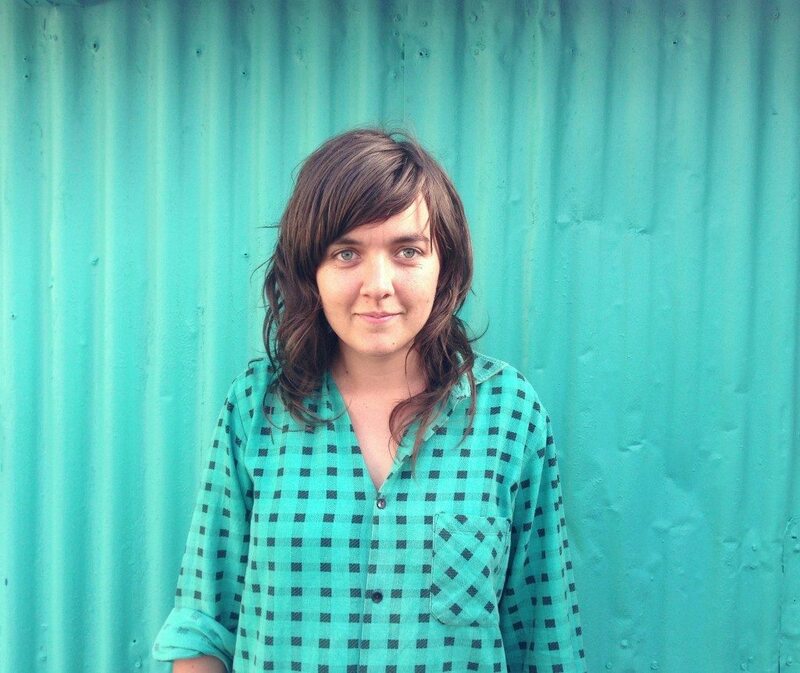 This is the first single from Courtney Barnett’s full-length followup to her EP, and it should dispel any questions about whether she can be successful long-term. Her energetic live shows have shown her to be a sick guitar player, and it was only a matter of time before she’d hit us with a banger like “Pedestrian at Best.” It’s her loudest and most intense tune to date. On the track, she maintains her style of writing earthy lyrics that come from the girl next door; “Put me on a pedestal, and I’ll only disappoint you,” she sings. Courtney is currently on the Australian Laneway Festival tour, which invades her home town of Melbourne this Saturday, February 7. She’ll undoubtedly receive quite a resounding welcome home. Reviewed by Bruce Rave. SoCal artist Jarell Perry brings his excellent and progressive R&B-influenced sound to The Bootleg HiFi in Los Angeles on Saturday January 31. 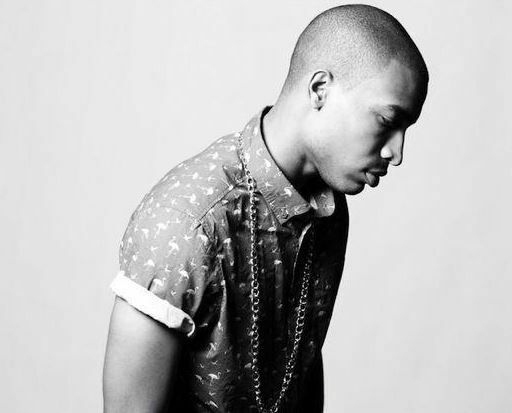 Jarell’s unique and potent blend of distinctive and affecting production and emotive tenor are especially powerful within a live setting. Catch the soon-to-be-star at our B3SCI Presents show with Jarell Perry at The Bootleg HiFi next Saturday January 31, details and ticket information can be found here.